I’ve been keeping a watch on the snowpack in California this winter. The snowpack is California’s most important source of water. It matters for Missouri because of the important role California plays in the national economy and in our food supply. 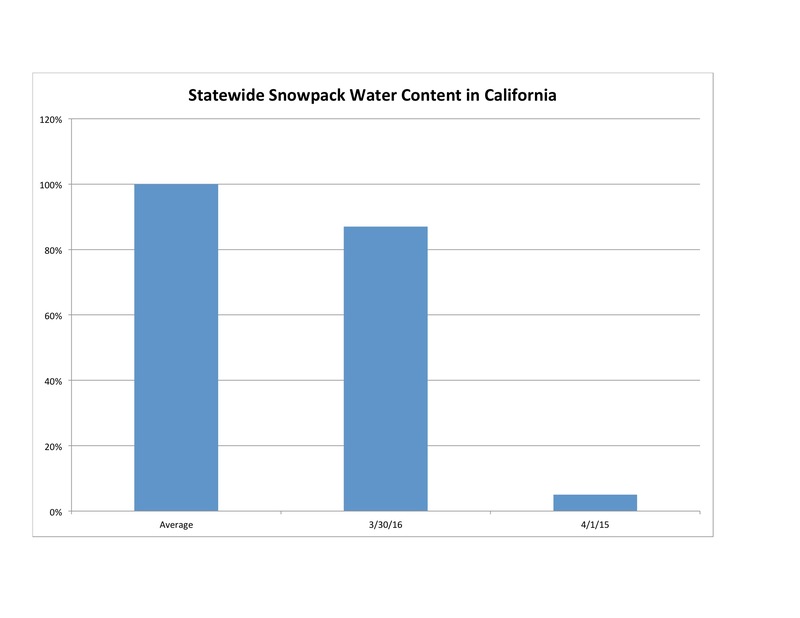 On March 30 this year, the water content of the snowpack was 87% of its historical average for that date. Last year on April 1 it was virtually nonexistent (Figure 1). The period around April 1 is when the snowpack is at its peak, and the amount of water in it now determines how much water California will have during the dry summer and fall months. Eighty-severn percent is obviously better than 5%. However, it is still below average. Water officials were hoping for a larger than average snowpack to begin reversing the multi-year drought the state has experienced. It was a winter with a very large El Niño, and those years typically bring California lots of precipitation, including lots of snow in the Sierra Nevadas. 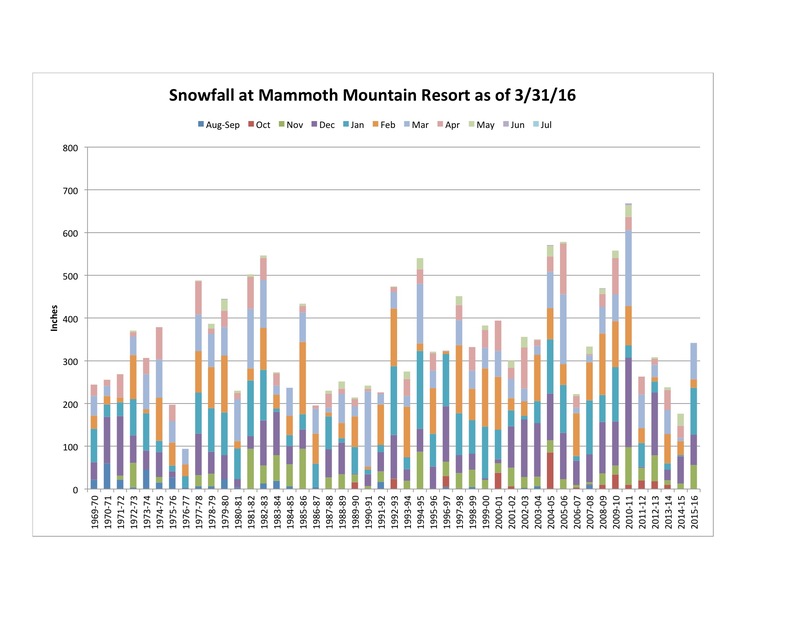 Snowfall data from Mammoth Mountain, one of California’s largest ski resorts, indicates an above average snowfall through March 31: a cumulative 342 inches of snow, vs. 304 in an average year. (Figure 2) Statewide data from Climate at a Glance suggests that precipitation throughout the state was 0.54 inches above average. If California received above average precipitation, yet has a below average snowpack, then one of the causes must have been a warm winter, causing the snow to melt. 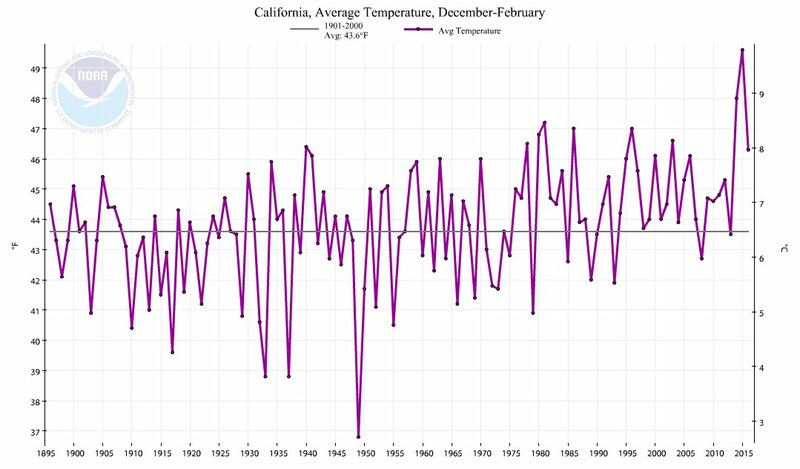 Indeed, as Figure 3 shows, California had a warmer than usual winter, 2.4°F above average. California’s man-made reservoirs are in better shape than last year. As Figure 4 shows, Lake Shasta and Lake Oroville water levels are above historical averages. (The red lines show the historical average for this date, the blue bars the current level of the reservoir. The yellow bars show the reservoir’s total capacity.) Some reservoirs, especially ones farther south, are still quite low. Notice how near the top of the yellow bar some of the red lines are. 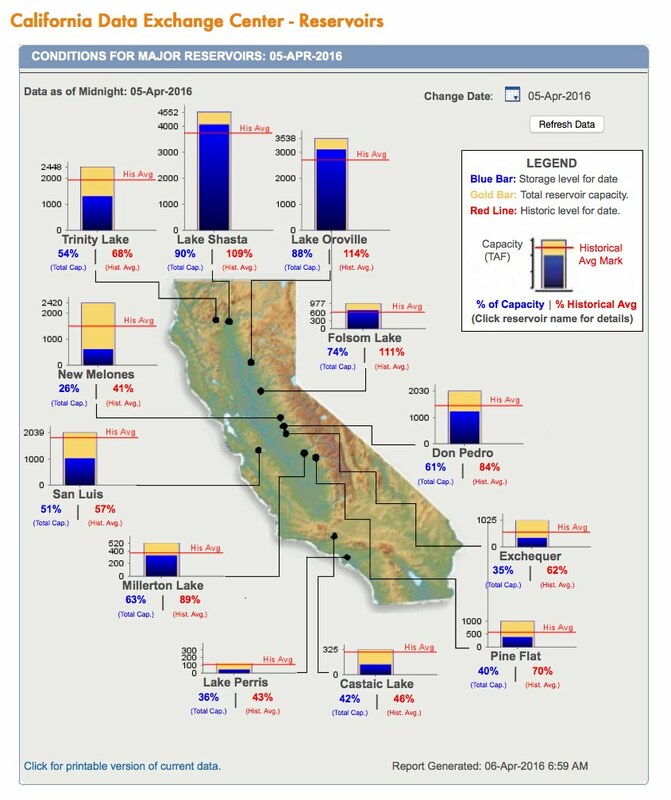 California’s reservoirs, especially the big northern ones, are typically pretty full at this time of year. Typically, California does not receive very much rain from now through the end of November. As water is drawn out of the reservoirs to service California’s needs, snowmelt from the snowcap flows into the reservoirs to recharge them. This process is largest during the spring, but it continues at reduced rates all summer and into the fall. A small snowpack means that there is less water to recharge the reservoirs when California needs it most. Lake Mead is at its lowest level in the last 10 years for this time of year. California has seen a partial easing of the very severe drought of the previous two years, but nothing to signal the drought’s end. This was supposed to be a wet winter leading to an above average snowpack, but because of increased temperatures, the snowpack was below average. The El Niño is now weakening and is forecast to end by summer. What will happen then, nobody knows. Lake Mead continues to lose water. Long term, California continues to face serious challenges regarding its water supply. California Department of Water Resources. 2016. Conditions for Major Reservoirs: 05-APR-2016. Downloaded 4/6/16 at http://cdec.water.ca.gov/cdecapp/resapp/getResGraphsMain.action. Water-data.com. 2016. Lake Mead Water Database. Database accessed 4/6/16 at http://lakemead.water-data.com. National Centers for Environmental Information. 2016. Climate at a Glance. This is a data portal. Accessed 4/6/16 at http://www.ncdc.noaa.gov/cag/time-series/us. By mogreenstats in Climate Change, Consumption and Supply, Water, Weather Patterns on 2016/04/21 .